Having over the years had 38 trips to Japan associated with my Martial Arts commitment to Kyokushin, this was to be my second trip to Okinawa. I was interested to discover the history of Karate in Japan and as it had its origin in Okinawa, I had a most interesting discussion with Sensei Hokama whose knowledge of the history of martial arts in Okinawa and his ability to perform them is truly amazing. We arrived in Okinawa on May 23rd. After checking in to the hotel, we proceeded to the Dojo to meet Sensei, have a meal together, and plan our training schedule with him. Sensei was waiting for us at the Dojo and greeted us with Tea and cakes. Introductions were made all round and after an enjoyable meal we departed to return to our hotel…and then the trouble started thanks to Shihan Cunningham who had seen a Yaki Tori bar near the hotel, and decided we should all have a beer before bed. Everyone spent the free day shopping for local artefacts and all managed to buy something of Okinawan origin. We thought this to be a free day however Sensei invited us to the Dojo for a “little warm up Keiko” and so it started! The training was excellent and much to our great discomfort, we were to discover many pressure points…thanks to Sensei…who was quite amazing with his knowledge. The next day there were more Gyaku Te techniques. We discovered even more pressure points…James had a truly unique experience when Sensei demonstrated one on him…everyone was seen to observe him react quite remarkably…jumping in the air and at the same time uttering something that would normally be taboo in the Dojo…but we all agreed that it was beyond his control. That evening we returned to watch the kids’ class and then trained with the adults…our first class with them and certainly something to remember!! There was lots of conditioning and Sanchin practice and then application of Kata techniques…we all enjoyed the class and were very happy when finally it was 10 p.m. and we were finished. The days progressed with Kata applications, pressure points and Bo training…the drills were repeated over and over again and Sensei stressed that a correct foundation was most important for Bo training, and so it went, stance, technique, repetition and correction. Between training sessions Sensei took us shopping, supplied us with watermelon and bananas, and a huge bottle of Okinawan Sake. 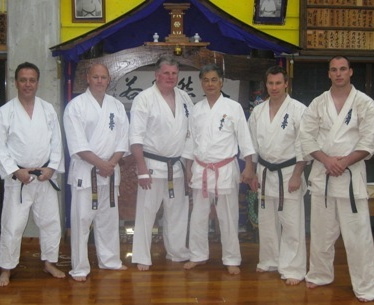 So the training was left to Sensei. Rick seemed to have this magical ability to produce alcohol wherever we went, James disappeared a couple of nights in spite of Mark’s best attempts to take care of him…and in the mornings he seemed not to know where he had been, and poor Idir was constantly disorientated. This trip I would say is the most memorable I have had to Japan…the instruction was amazing, everybody enjoyed it and had their knowledge expanded, and all enjoyed each other’s company both during training and after. We returned to Sydney on June 3rd, enthusiastic and grateful for the experience. 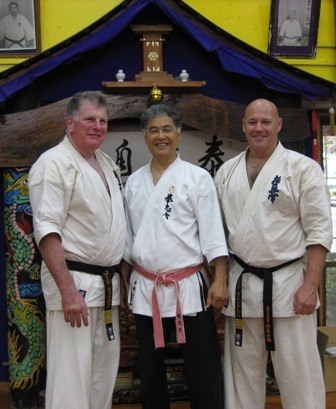 This Sensei is a truly amazing Martial Artist and we were really impressed. So much so that Shihan Cunningham and myself will return on August 19th for a further 10 days training.